Trial of Thomas Fuller Harnett for forgery, Proceedings of the Old Bailey, 18 Sept 1820. See p.544 and p.545. 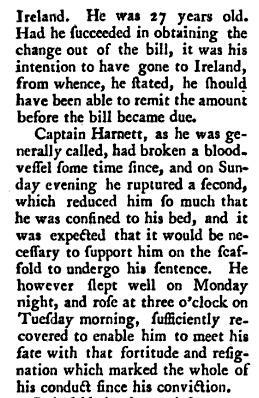 Account of execution, Morning Post, 6 Dec 1820. Account of execution, Cambridge Chronicle and Journal, 8 Dec 1820. "Execution of Captain Thomas Fuller Harnett and Ann Price", broadside (news-sheet) published 1820. Copy in Execution Broadsides, National Library of Scotland, RB.l.238. Notes on Thomas Fuller Harnett by Teresa Stokes. King's Bench Prison: Commitment Books. In [NA.UK] PRIS 4.
hanged for forgery in 1820. His mother re-married 1794 to William Ponsonby of Crotto, Co.Kerry. Thomas became an officer in the army. He joined the 82nd Regiment of Foot aged 15 (1808) as an Ensign. 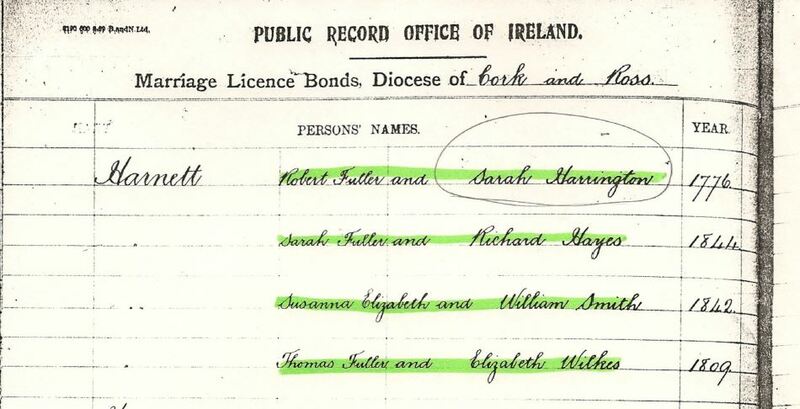 He mar 1809 (him only age 16) in Diocese of Cork and Ross (see entry) to Elizabeth Wilkes. She was dau of Charles Wilkes of Ballincollig, Co.Cork [Fuller, 1866, p.356]. [Deed, 1810] concerns various lands in Co.Kerry which were devised to Thomas Blennerhassett of Cork by Thomas Fuller Harnett. Thomas became a Lieutenant and then a Captain. He got a large inheritance, perhaps when his mother died 1812. [1820 plea for his life] says "he only came of age in the year 1812". But 1812 was not when he came of age (age 21). It was when his last parent died. 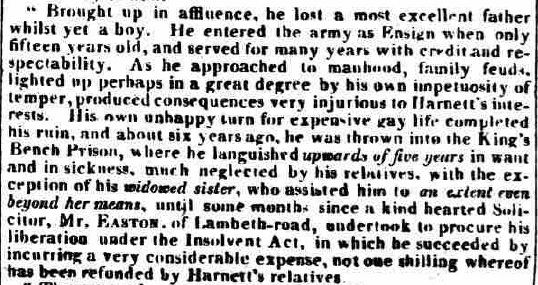 [8 Dec 1820 article] says he inherited age 21 (1814). When he got his inheritance, he left the Army. He soon wasted his inheritance. He fell into debt, and in Oct 1814 he was jailed in King's Bench debtors prison. He spent over 5 years in debtors prison, 1814-20. He became a drug addict while in debtors prison. He said at his trial in 1820 that he broke a blood vessel c.1818 and was given laudanum (tincture of opium), to which he then got addicted. A benefactor got him freed from debtors prison in January 1820. 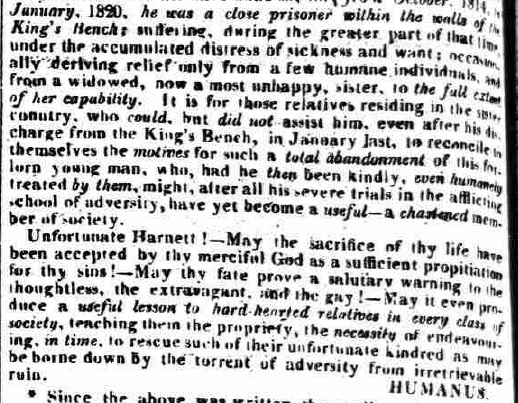 [1820 plea for his life] says "a kind hearted Solicitor, Mr. Easton" paid to get Harnett released, "incurring a very considerable expense, not one shilling whereof has been refunded by Harnett's relatives". Outside of prison after years, his career ruined, he soon became so much in need of money that he resorted to forging a cheque. He was arrested 11 Aug 1820 in his bed at The Old Bull and Bush, Hampstead, London (see modern street view). When arrested he said: "Good God! I am undone. It is all my friends' fault that they did not relieve me." 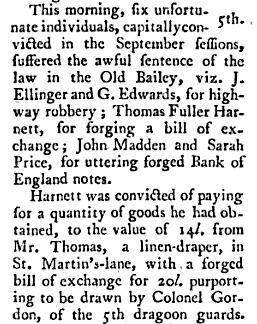 See his trial for forgery, 18 Sept 1820. He was found guilty. [8 Dec 1820 article] says the Duke of Wellington (who knew his step-father William Ponsonby) and the Duke of Richmond pleaded for mercy for him, without success. See also anonymous [1820 plea for his life]. He was hanged by the hangman James Foxen at Newgate Prison, London, on 5 December 1820, age 27 yrs. The trial and execution of Thomas Fuller Harnett. From [Annual Register, 5 Dec 1820, pp.128-129]. Notes that when in debtors prison he was "supported by the bounty of a kind sister". 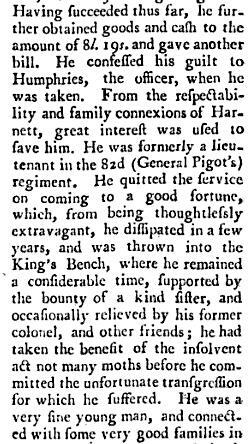 "The late unfortunate Mr. Harnett", Morning Post, 11 December 1820. This is a lengthy account by an anonymous gentleman of his failed attempts to stop Harnett's execution. The writer is angry with Harnett's "hard-hearted relatives" in Ireland for abandoning him. George King, 3rd Earl of Kingston pleaded for Harnett's life in 1820, and may be the anonymous gentleman above. See letter of 1 Dec 1820 regarding plea for mercy by Lord Kingston in case of Thomas Fuller Harnett. Political Papers of the 3rd Earl of Kingston. Doncaster Archives DD/DC/P2/21. See KINGSTON in [Burkes Peerage]. See biography of 3rd Earl of Kingston on site of Chris Oakley.